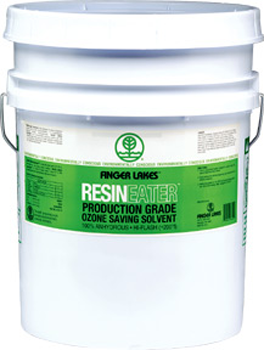 Finger Lakes Resineater is a pure solvent designed to replace ozone depleting solvents such as 1,1,1 Trichloroethane, Trichloroethylene, Perchloroethane, Freon and Methylene Chloride. Resineater will effectively remove resins, glue, tar, grease, polymers, paints, and coatings. It is also a very efficient urethane flush solvent. 1. Parts can be immersed, sprayed, or dipped and wiped. 2. USE AS IS: do not attempt to dilute. 3. This product WILL NOT blend with water. 4. Heating Resineater to 170°-180° will enhance cleaning ability and decrease cleaning time.